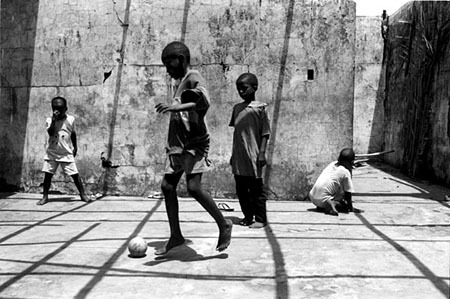 Football as rehabilitation in Liberia. It's raining in Monrovia, the capital of West African Liberia. Fortunately this time, not with the bombs and bullets that prevailed over the country's seven-year conflict. Now children dart for cover from a torrent of water that brings some respite from the merciless heat. Waged from 1990-1997, the civil war divided a once prosperous nation. The town reads like a map of conflict, and many of the scars still remain, as Liberia grapples with its ruined infrastructure and struggling economy. Money changers crowd street corners trading Liberia's only unit: ragged $5 bills known as the Liberty', which were last printed in 1991. Street hawkers use wheelbarrows to cart around every conceivable commodity, thus bringing new meaning to the concept of sales strategy.